Pens out, heads down: I’m off on a training course. | YOGALEN. Dynamic yoga in Glasgow. Pens out, heads down: I’m off on a training course. In London. For two weeks, 10-21 February. It’s a 100 hour body module for yoga, so I’ll be studying anatomy, nutrition, and chakras – which are bit like pakoras, I think. The lovely Laura will be covering my classes at Glasgow University (Tuesday and Friday mornings). I’ll be back on Monday 24 February for class at Hillhead Sports Club, 7:15-8:15pm. In the meantime, stay active, stay happy! It’s simple idea: be happy for 100 days. Take a photo of something that made you happy that day, upload to your preferred social network (or my facebook page) with the #100happydays tag and BOOM you’re spreading that happiness. 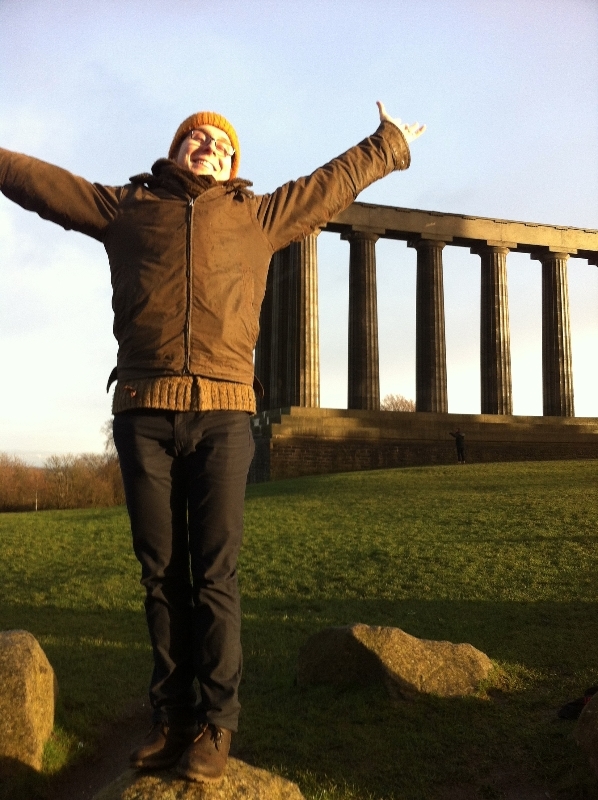 Standing on a rock in a rare bit of sunshine on a torrential day in Edinburgh. There was also a rainbow, but that was too cheesy for my phone camera to pick out. This entry was posted in Blogs and tagged dynamic yoga, Enter your zip code here, Glasgow, yoga. Bookmark the permalink.